Hi ladies! HAPPY EASTER! Once again a lack of posts from me unfortunately as I'm still unwell - I felt fine until Wednesday and then BAM! the hearing went and the vertigo hit again ARGH. I haven't been up to doing much but I got so sick of having bare nails I had to do some Easter nail art!! I couldn't pass up the opportunity to break out my pastel colours (not that I need any excuse too haha!) so here's my Easter manicure for you all. Please excuse my dry cuticles as I've been lazy to apply my cuticle creams and hand lotions. Pinky: 1 coat of OPI Sparrow Me the Drama and 1 coat of China Glaze Empowerment. I then konaded diagonal design from Konad plate m65 using China Glaze Admire. Ring finger: 3 coats of Face of Australia Lemon Sorbet. I then konaded the duck image from Konad plate s10 using Sally Hansen Complete Manicure in Kook-a-Mango. I used a dotting tool from Born Pretty Store (review to come) to add a black dot for the eye. Middle finger: 2 coats of Face of Australia Minty Mojito. I then used Sinful Colors Snow Me White and dotting tool from Born Pretty Store to add white dots. Index finger: 2 coats of OPI What's With the Cattitude. I then used Essence french manicure and pedicure pen pearly rose tip painter to draw the zigzag lines and Kiss nail artist paint striper in black for the horizontal lines. Thumb: 2 coats of Barry M Berry Ice-cream as base colour. For the freehanded bunny design, I used Sinful Colors Snow Me White for the face and Kiss nail artist paint striper in white for the ears. I used Essence french manicure and pedicure pen pearly rose tip painter for the ears, nose and cheeks and a black creme with Born Pretty dotting tool for the eyes and white for the eye detail. I asked D to not bother giving me any chocolate this year as I'm "trying" to cut back on my sugar intake but of course he didn't listen! 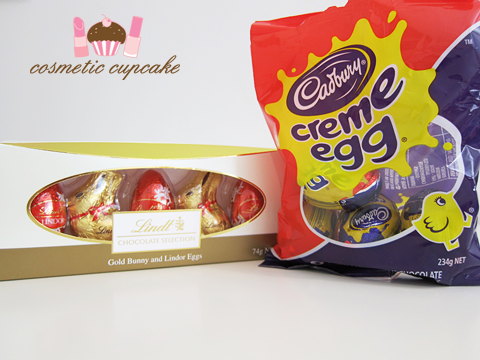 Ahem you will notice that the packet of Cadbury creme eggs is already nearly half devoured before I even took the photo - I totally fail at resisting chocolate! xD Especially creme eggs OMG. On another note, I've been included in a list of the Top 50 Chic Beauty Blogs which is so awesome!! I'm honoured to be in such great company. I hope you are all having a happy and safe Easter weekend =) Let me know how you're spending your weekend! Thanks for looking as always! Don't forget to enter my Glitter Gal giveaway! Oh that little chick is soooo adorable!! 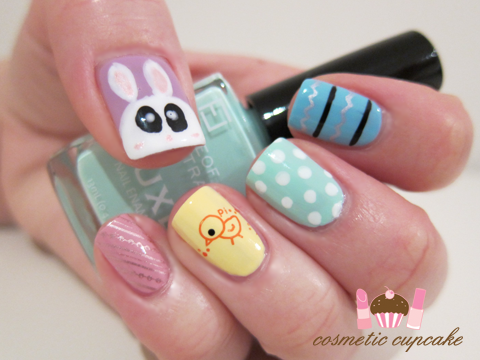 This Easter mani is so cute! so cute! I always love the colors you use on your mani's. I'm sorry to hear you're still feeling unwell, that's no fun at all. Hopefully you feel better soon. As for the nail art, impeccable as always. My favourite is the mint with polka dots but I love each design. They work together as a whole really well. Perfect design for Easter. nawww the bunny and duck are cute! happy easter chelle! :D This looks adorable! Happy easter! 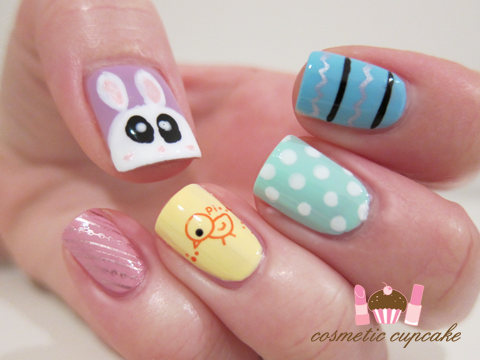 I love the Easter manicure, really cute! This is adorable! I especially love your ring & index fingers. Especially love the little chicken! The thumb is SSSOOOOOOOOOOOOOOOO cute!!!! OMG, how did you do that!? So detailed and cute !!! !